THE former West Indies Test captain Sir Frank Worrell has severly criticized the decision to allow football matches to be played on the Queen's Park Cricket oval here on January 19 and 27. On January 19, a Brazilian youth team will play Combined Colleges and on January 27, it will play a Trinidad team. Sir Frank said Trinidad was "doing a most stupid thing," by allowing football to be played on the oval, the venue for a regional cricket series which starts on February 2. He continued: "It's not fair to West Indies cricket. After all, we want to win in England later this year." He said the wicket might still have boot impressions on it when the cricket series was played and the only way to get rid of these would be by f[illegible]. Sir Frank added: "I want it understood that I love football just as much as anybody else and I don't want to stop Trinidadians from seeing the Brazilians — but not at the expense of our cricket." Meanwhile, the Trinidad football Association has alerted 24 players undergoing training with a view to selecting a team to play against the Brazilians. 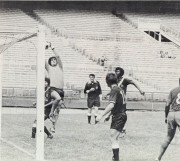 Those called include goalkeepers Jean Moutett and Clyde Burnett, backs: Clem Clark, Henry Mulzac, Henry Govia, Brian Grell, Selwyn Murren, Malcolm Mason, halves: Sedley Joseph, Victor Gamaldo, [illegible], forwards: Richard Stewart, Andy Aleong, Alvin Corneal, Arthur Brown, [illegible] S[illegible], Jeff Gellineau and Bobby Sookram.